Held during the month of December at Oregon Camp. Here, we experience heavy winter rainfall and high humidity conditions. Two good reasons why I offer this course during this time of year. It’s wet and I can’t start a fire! It’s one thing to practice fire craft during the warm and dry months of summer. But add driving rain and howling wind to the mix. Now you have perfect conditions to test and challenge your fire-making skill. I’m down to my last match! 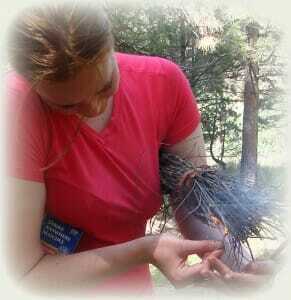 As a student you will learn and apply a variety of ways to make fire during the Fire Craft course. We will cover wooden and paper matches, lighters, flints, and magnesium. 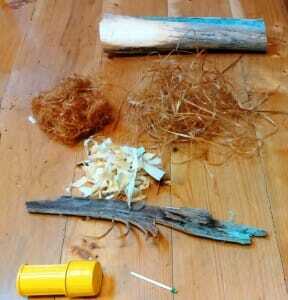 You will learn to use plant and tree materials and where to find the best kindling and tinder. I’m cold and sopping wet! Understanding the mechanics and science behind fire-craft is important for success. We know that without enough oxygen for combustion we will have poor results. And we also know that not having enough dry fuel will make it difficult to make a good hot fire. Fire Craft makes the difference! The difference between an uncomfortable night out or a life threatening one. Mastering fire empowers you for success in wet and hypothermic conditions. Where you will succeed, others fail. Our goal is to build a strong foundation in basic fire making. Students learn and practice with hand-on instruction for success in extreme wet conditions.